Wednesday was a full day of propagation. - For someone like me who is a plant fan (yes, total fanatic) it wasn't a difficult day, and as I was in the company of some lovely people it passed very quickly. In the morning I hosted the first of this year's "Cutting gardens from seeds and bulbs" workshop. A bleak February morning isn't necessarily the most pleasant time of year to spend on my exposed field, but as these ladies were keen to know how to improve their flower yields from whatever their size of patch this year, they braved the M25, and came layered up to learn about how I plan and pick out the flowers and fillers to grow on my field. We started with my explanation of the types of stems to put together to make a bouquet. - This was where my journey from "pick and plonk" to British flower floristry started 3 years ago. My Hellebore foetidus gave a fantastic example of a sieve as a base foliage. After coffee and marmelade muffins (well done Ashley your homemade marmelade was the star sticky ingredient) We warmed ourselves up in the Polytunnel, and I gave demonstrations of seed sowing, potting on, and taking cuttings. By Lunchtime everyone went home with a tray full of seeds, - and pots of cuttings, - Rosemary and Dianthus Green trick, plus lots of root cuttings of mint. Thank you all for your enthusiasm, which was infectious. Despite the cold and damp, I stayed on when everyone left, and made 2 more trays of green trick cuttings, and planted out more Ammi and Larkspur. Then I went home and took more Dahlia cuttings. - Richard from Withypitts Dahlia's (from his workshop in January) had produced more, plus the tubers I put in the propagator were sprouting as well. so i've now got Cafe au Lait, and Pink Diamond being molly coddled in the greenhouse at home. But my day wasn't finished, as in the evening I walked down to the Village Hall to our Garden Society meeting, and listened to Nick Morgans from RHS Wisley give a talk about propagation. An extremely good turnout for a February evening showed how much esteem our group hold Nick in, and his talk was informative, educating, and entertaining. - I may even be tempted to try propagating some houseplants again. There were lots of points that we both agreed on, and think are extremely important for anyone propagating new plants, - the most important are. Propagation is something that can seem scary to new gardeners, - but with just a bit of direction and practice, you could be producing hundreds of productive plants. - If by some chance you have too many of them, the Horsley Garden Society Annual Plant Sale is Saturday 9th May, - entry is 3 plants (or 50p) come and see what we've all been propagating. What do Flower farmers do in winter? It's been cold the last couple of weeks. - Too cold to do anything at the farm other than a bit of shoveling of wood chip (thanks to my wonderful local Tree Surgeon Paul). So what else do Flower farmers do in winter? Nothing like using your quiet season to go and learn more from the experts. in this case Withypitts Dahlias . Richard from Withypitts showing us the correct way to take Dahlia cuttings. As soon as I got back I filled my temperature controlled propagator with dahlia tubers, sitting in compost, to start them growing. -I'll let you know how they come on. Mostly meeting with lots of other flower growers, (and lots of members of Flowers from the farm) chatting about what they're up to, what's going well for them. Talking to florists about what flowers they want in the coming season, and generally putting the world to rights, and enjoying others company. plus i've been Writing lots ready for some Talking i'm doing over the coming weeks. 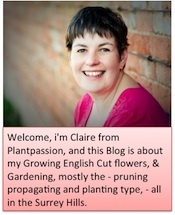 There's a "business of selling flowers" workshop on Monday, and i'm talking to the Farnborough Fuchsia and Pelargonium Society next week about Herbs, and there are Growing your Cutting garden from Seeds and Bulbs workshops at the end of the month. and of course i'm answering all the email enquiries that i'm receiving about flowers for weddings and events later in the season. So although it's still snowing outside my office window, - there's lots to be done, - better get ticking things off that to-do list.